Looking for a legal way to convert iTunes M4P songs, Apple music and audiobooks to MP3 on macOS so that you can enjoy your Apple music and audiobooks on any non-apple players like Android, PCs, MP3 Players, Tablets, Sonos, SmartPhone or car player? You've come to the right place! Absolute freedom for your Apple Music and Audiobooks, Enjoy your iTunes songs and audiobooks freely without any limitation on any portable devices you like. M4P to MP3 Converter for Mac is the all-in-one solution for people who purchased Apple music, old iTunes songs, audiobooks and video from iTunes store but have compatibility issues with their mobile devices. 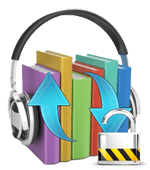 This application can bypass iTunes DRM-protection and is able to convert M4P, M4A, M4V, M4B, AAC, AA and AAX files to various audio formats including MP3, M4A, MKA, FLAC, AIFF, AAC, M4R, AC3, and AU. Ready for using on any other computer or mobile devices such as Android, MP3 player, Car player, iPhone, iPad, tablet PC, smartphone, Sonos, and etc. This software can not only convert Apple music and audiobooks, but also quickly extract audio tracks from iTunes video (M4V or MP4) files and save in audio formats with CD quality at 50X high speed. This Mac iTunes M4P converter uses advanced DRM-removal technique. So that you can convert any DRM protected music without any restriction. it is easy to enjoy apple music anywhere! Designed for OS X 10.8 to macOS Mojave users. Looking for a Windows version of M4P Converter ? Go to Easy M4P Converter for Windows. 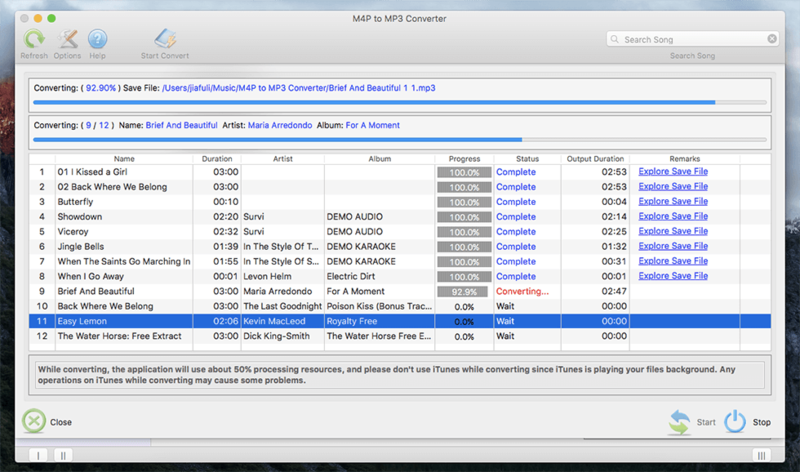 The latest version of M4P to MP3 Converter fully compatible with iTunes 12.9.3 and later. Legally remove DRM from Apple music & Convert M4P to MP3. Do you want to play your Apple music on your other computers or digital players? With this easy iTunes DRM removal software, it will be possible to get rid of copy-protection from iTunes M4P music, and convert Apple music to unprotected audio formats with ID tags preserved. Never deal with DRM-protection problems again. Your Apple music, any way you want it! 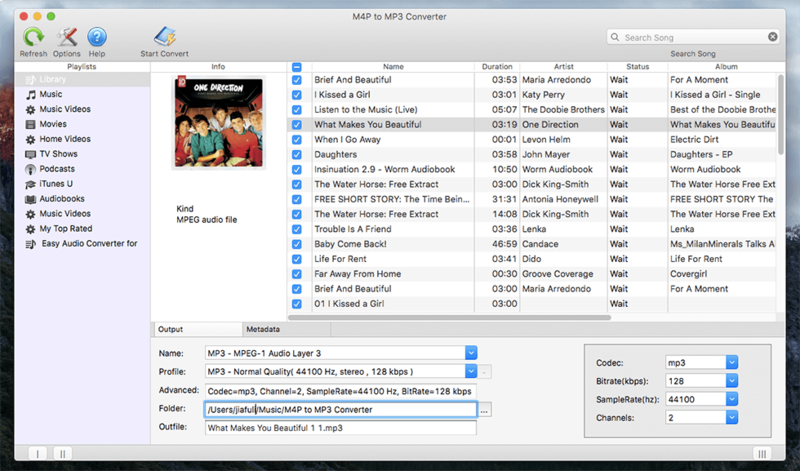 M4P to MP3 Converter for Mac has been solving all iTunes DRM protection issues since 2007. Enjoy any audiobooks on any device, - anywhere! 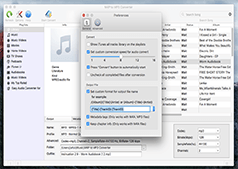 It is also an Audiobook Converter for Mac, batch converts DRM protected iTunes M4B, and Audible AA, AAX files to more universal audio formats, such as MP3, M4A, M4R, AAC, AC3, FLAC, AIFF, AU, and MKA. AudioBooks chapter information will be preserved in the output M4A files. Audiobooks in MP3 format are commonly used and can be listened on almost any portable devices. Convert iTunes video to MP3 on Mac. Sometimes you might need to extract favorite audio from iTunes M4V video and TV shows to be able to listen to it using your MP3 player. 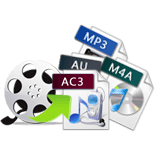 With M4P to MP3 Converter, You can easily and quickly convert DRM protected videos (M4V), unprotected video (MP4, AVI, MPEG, MOV, MKV) and TV shows purchased or rent from iTunes to different audio formats on Mac, and enables you to save your audio in MP3, M4A, AAC, AC3, M4R and more formats for your special enjoyment. Batch iTunes video to audio conversion is also supported. Convert unprotected audio to MP3. In addition to convert DRM protected Apple music, it also can convert almost all non-DRM audio and video that could be played on your iTunes. 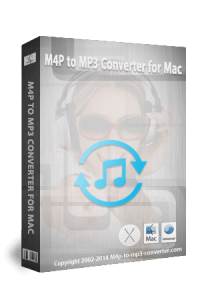 M4P to MP3 Converter for Mac always provides you with the best solution for converting iTunes music on your Mac and preserves 100% of the original sound quality. Batch conversion function saves more time, users can take advantage of this function to convert multiple iTunes Music collections in one go. You can select several music files or several playlist to convert as a batch. It offers up to 50X faster conversion speed which is beyond your imagination. The convertion speed of it can be 10 times faster than other Apple music conversions with the same audio quality. Fully compatible with the latest iTunes 12.9.3.3. The only legal way to remove DRM from iTunes M4P, M4B, M4A, M4V, protected AAC, Audible AA and AAX files. [NEW] Supports DRM audio formats: M4P files downloaded from the new apple music service + M4A files that you buyed on Apple iTunes store. Export audio from iTunes M4V video for playback on any portable device. Adjust advanced audio parameters like encoder bit-rate, sample rate, codec, and audio channel to optimize your iTunes conversion. Set a range of parameters to customize your audio output. Get the 100% same quality as original, including channel, audio codec, sample rate, bit rate, and etc. Support edit the audio track title, artist, album cover and etc. Fast & friendly technical support is available for every user. Available in 7 languages – English, Spanish, Deutsch, French, Japanese, Simplified Chinese and Traditional Chinese. Specially designed for Mac users & All features are fully supported on macOS 10.8 - 10.14.3, including macOS High Sierra and Mojave. 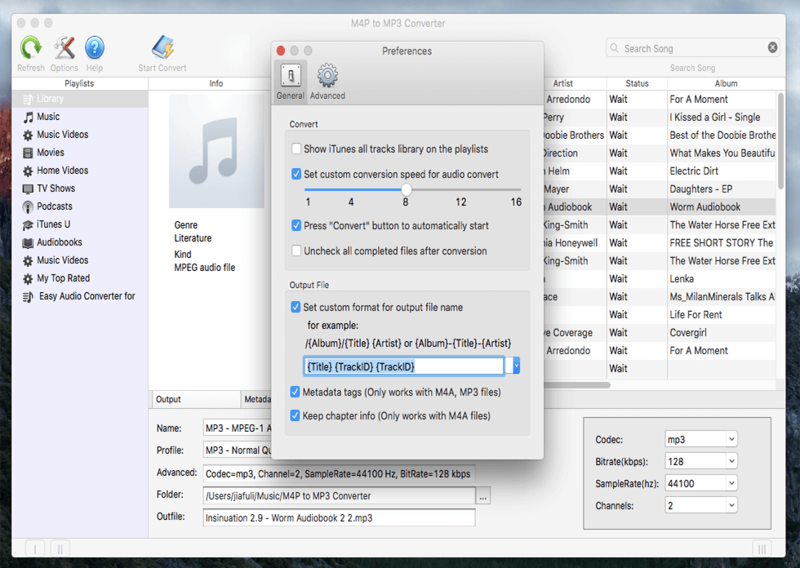 If you have purchased lots of Apple music and audiobooks from iTunes store - let M4P Converter be your assistant. Start using with full-functionality right away. see how easy it is to convert your Apple music and Audiobooks! > Ready for macOS 10.14.3 Mojave. > Apple iTunes must be installed. > Compatible with iTunes 12.9.3.3. Why Choose M4P to MP3 Converter? Email Response within 24 Hours. Usually faster.